How You Can Leverage the program that helped me ascend into #1 bestseller status on The Wall Street Journal, USA Today and also as a New York Times bestselling author. **PLEASE NOTE - when you sign up, and you are asked for a phone number - please include your MOBILE number in that field. That way, you can participate in this unique mobile device experience! 1. An instant coaching reminder via text and email. Each message is designed to encourage you to pop in, get coached and then carry on with your day - inspired, motivated and clear on next steps. 2. A video link from my studio to your eyeballs. Each video link is meant to be less than 2 minutes and correlates specifically to the lesson at hand. 3. Retention material to back up the video PLUS a points for a quiz. You've watched an explanation video. Now, did you retain the information? If you are a bit foggy on the answers, read the back-up information or rewatch the video and make sure it all sinks in. 4. We track your points. You will know how well you are doing relative to other participants. We have "gamified"ELEPHantPOWER Mobile Coaching so you can feel the love. Plus, if you are in this quarter's top 10, you will get a free digital copy of Invinceable Principles, Essential Tools for Life Mastery. In addition to the points, you will have the benefit of 10,000 hours of research distilled into bite size chunks of personal growth. Direct and Easy access with "Mobile Coaching"
Retention tools to ensure you "Get what you want." Vince Poscente delivers expert online training to people wanting to reach their goals in a short period of time. We live in a world obsessed with instant gratification. It stands to reason a living thing will become a product of the environment it is in. Hence, if you know you have the ability to delay gratification, you are to be applauded. But we all have an undeniable tide pushing for faster and faster results. This may explain the increasing overwhelm with all we have to get everything done in a day. Overlay this with a shorter patience fuse. If we don’t see results, we get frustrated. This module is a metaphor for patience and delayed gratification towards reaching your oasis. For grins, let’s say your elephant buzz dream is to have a bucket of blue water. You start with a clear, 5,000 gallon bucket and a vial of blue dye. You are only allowed to put one drop of dye in the bucket per day. If you miss a day, you cannot catch up with two drops the next day. Each day you drop the dye in the bucket you will not be able to discern the bucket getting more blue than clear. 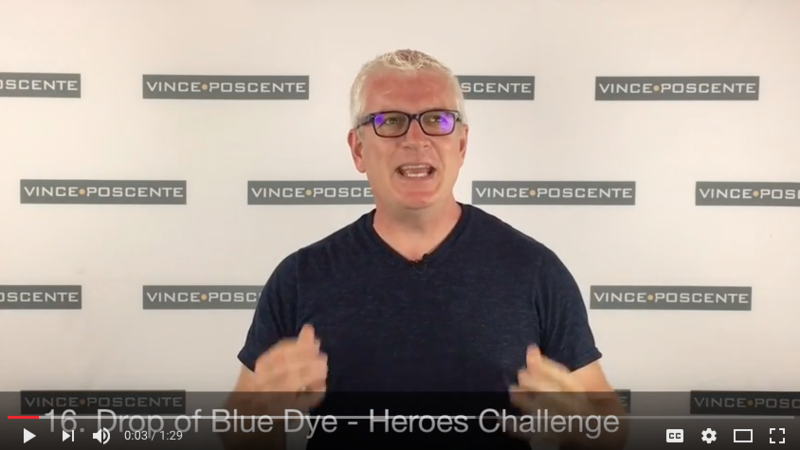 In a world of instant gratification, we will tend to get bored with the “blue dye strategy” because we cannot tell it is working. The moral of this metaphor is to stay the course. Do not give up on your consistent efforts. They will pay off. Remember to keep your homework in a special section on your smart phone or personal computer. Keep this document for you to refer to at a later time. Note: You must include both the hashtag (#) and the word Free in your message to that number above to be automatically signed up.